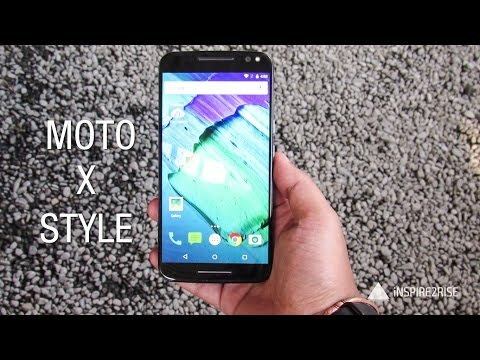 If you own Motorola Moto X Style, please do leave your feedback too. The phone features a 5.7 inch LCD display with a resolution of 2560 X 1440 pixels. This gives the phone a pixel density of 515 PPI, which is one of the best in its class. The Moto X Style is powered by Snapdragon 808 SoC which has an Octa Core CPU, with each core firing at 1.8 GHz. The phone has 3 GB of RAM. Moto X Style comes in two memory variants as you have a 16 GB version and a 32 GB variant. If that is also not sufficient, you do get a slot for Micro SD card expansion too. A unique feature of the device is its Water Repellant Nano-Coating which makes the phone water resistant to a reasonable extent. Moto X Style has a removable back shell, which means that users can swap the back panel for a more colorful one, giving their device a new personality. The rear camera is 21 MegaPixel while the front facing sensor is 5 MP. There is a flashlight, both on the front and back of the device to help you with photography in low light. You have dual front firing speakers for a stereo sound effect, making multimedia consumption on the device a breeze. Just like all the Motorola devices, the Moto x style is running Vanilla Android with some Motorola add-ons. It comes with Android 5.1.1 out of the box. On the connectivity front, you have a Dual SIM configuration with support for Indian 4G bands. 1. Does the Moto X Style support Reliance Jio network? Ans. Reliance Jio network with VoLTE calling is not supported with the Moto X Style. Ans. No, this phone does not have a hybrid SIM slot. 3. Will this support my existing Nano SIM card? Ans. Yes,both slots in the Moto X Style accept a Nano SIM card. Ans. The phone uses a micro USB port for charging and data syncing. 5. What is the internal storage size available to install apps? Ans. You get 12.51GB storage available to install apps and store other data out of the 16GB onboard storage. Ans. Yes, Moto X Style has 4K video recording capability. 7. What are the in-box contents received with the device? Ans. Moto X Style box contains the handset, wall charger, data syncing and charging USB cable, a pair of earphones and additionally a translucent TPU case to protect the phone.